We had an amazing weekend in Paris last month and were very lucky to have such warm weather in April. 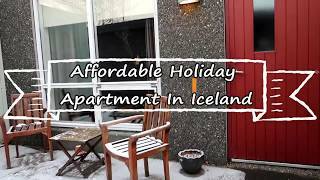 We were only there for a total of 3 nights, which gave us 2 full days to explore the city. It’s amazing how much you can see in that time, particularly when you make use of the Metro to get to locations further away from the centre. Before you go I really recommend reading some books about Paris with the children. They will get a lot more excited about seeing different landmarks if they have read about them in a book. 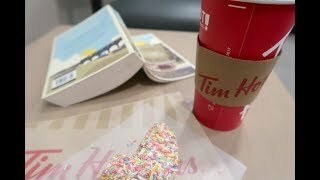 We bought two Paris story books for the kids to read in advance and also a Paris sticker book for our 4 year old and colouring book for our 6 year old for the plane and whilst waiting for dinner. 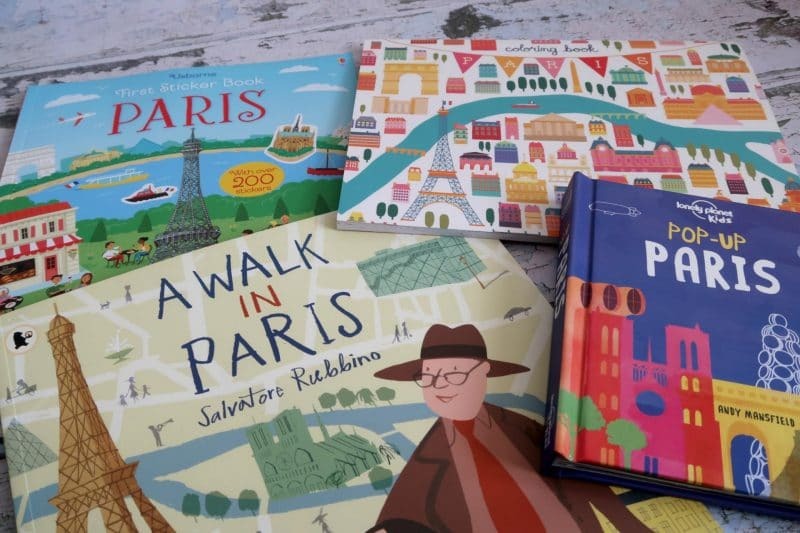 ‘A walk in Paris’ by Salvatore Rubbino is a brilliant story for younger children. It literally walks them through the streets of Paris in the company of a girl and her Grandad. 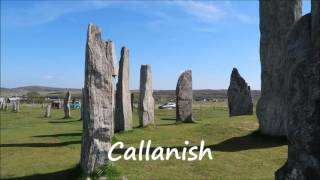 Most of the famous landmarks are covered as well as little bits of French language and culture. 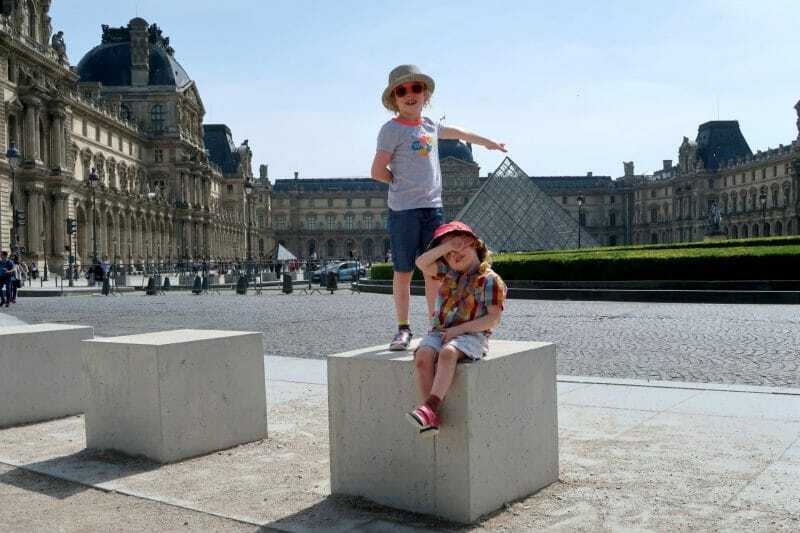 The Lonely Planet Paris pop-up book is great for younger children to identify the landmarks they might see. 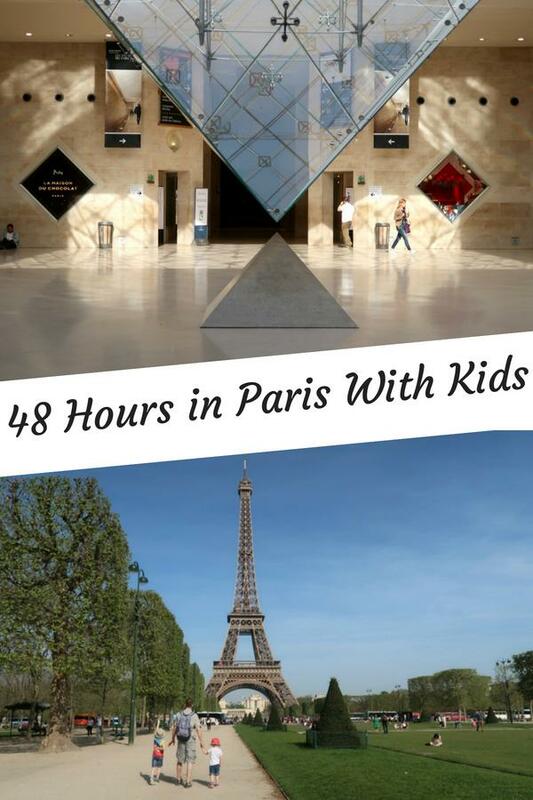 So, you’ve read the kids some Paris books, now here are our suggestions for 48 hours in Paris with children! We always have breakfast at the hotel with our kids as it’s generally a lot more choice and a fairly cheap addition to the room. So head down to breakfast early and fill up with food, then start walking along Paris’ beautiful streets toward the Eiffel Tower. 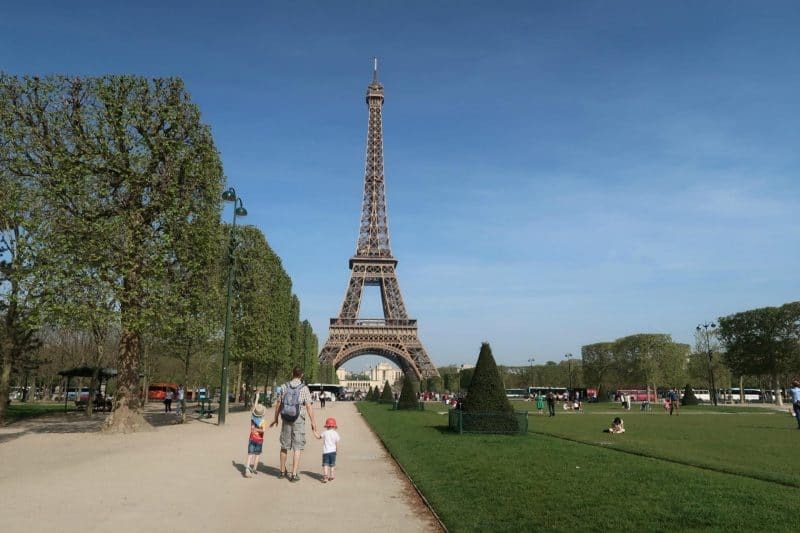 Depending where your hotel is you will approach the Eiffel Tower from different directions, but it really looks the best walking through the Parc du Champ de Mars. You can get a fabulous view of the tower rising above the parkland. 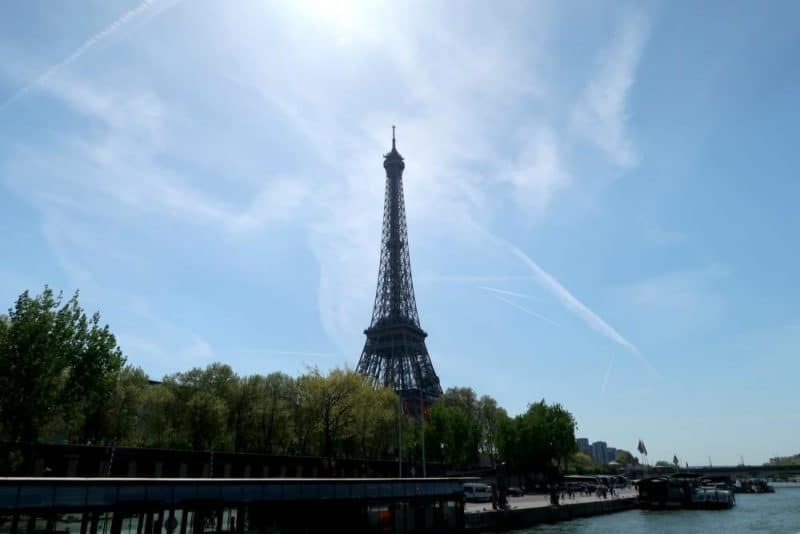 The Eiffel Tower looks fabulous from the ground, but even better is to enter the tower and go up the lifts to the top. 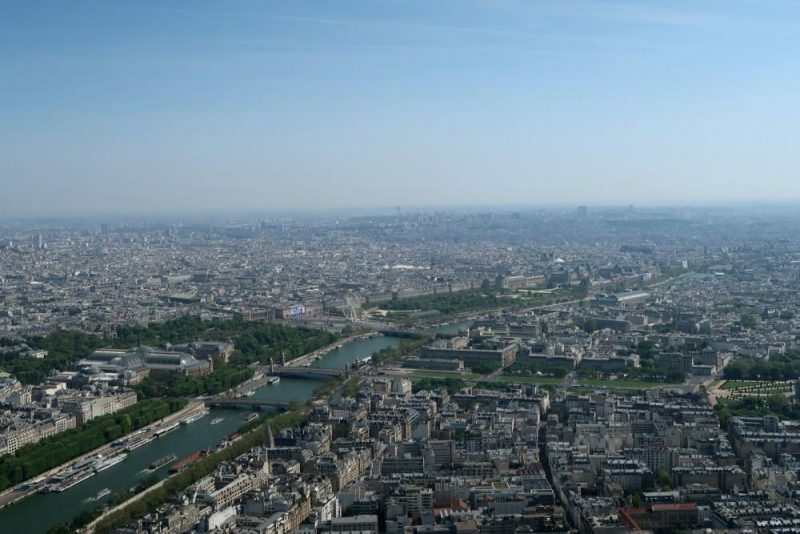 The view of Paris is awesome and you can see so many of the famous landmarks, you can read more about our visit here. You can grab some lunch at one of the restaurants or stalls on the tower or underneath it. 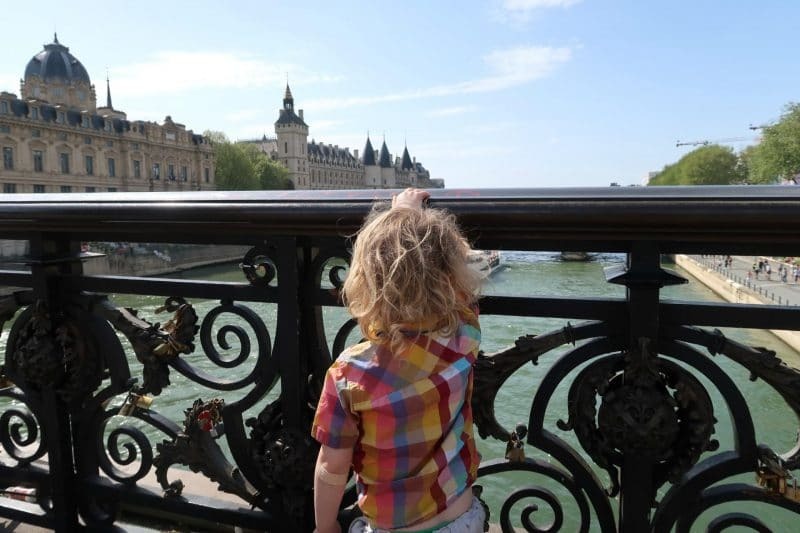 Most children love a boat trip and from the Seine you can see quite a lot of the city centre. The boats leave from just below the Eiffel Tower, so it’s a short walk to jump on the next boat to see the river. Our own boat trip was with Bateaux Parisiens, who have seating both undercover and on the top deck, with plenty of space for everyone. 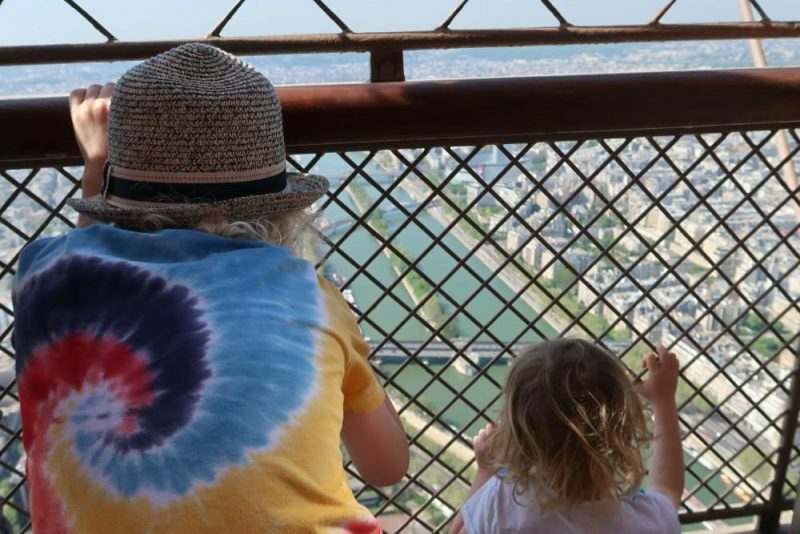 The boat journey lasts around an hour and you travel under the many bridges, seeing major sights including the Louvre, Musee d’Orsay and Notre Dame. The boat then turns and heads back on the other side of the islands. 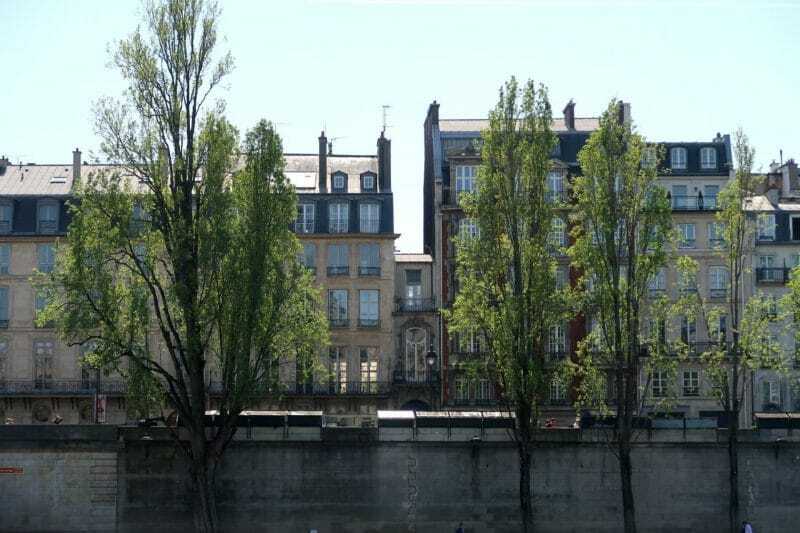 It’s a great introduction to Paris and seeing some of the buildings up close from the boat. 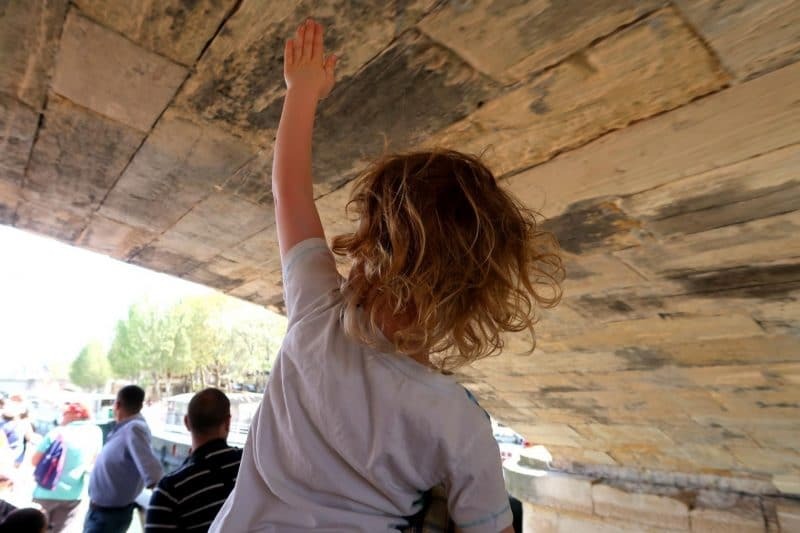 The bridges are also fun and littlest was determined to try and touch the underside of the lower bridges! 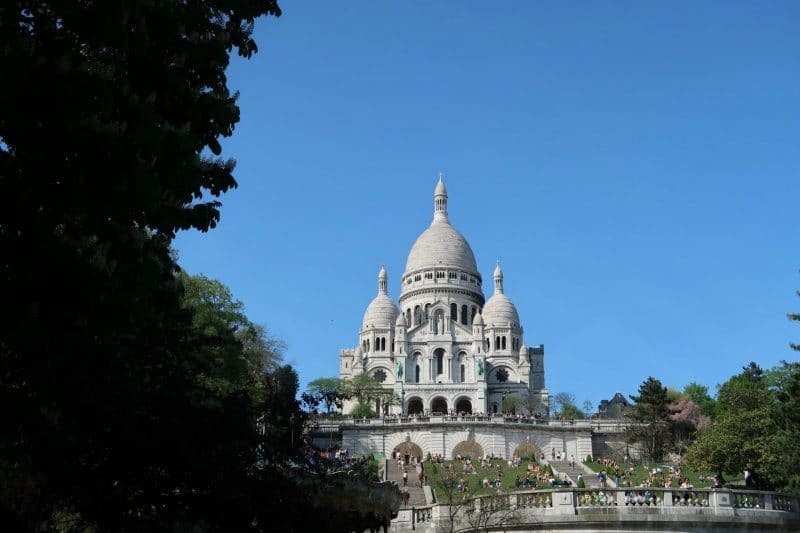 The boat passes many of the famous landmarks of Paris, as well as some of the lesser known ones. Below is the narrowest house in Paris, which looks so sweet! Once you are back on dry land there’s always time for an ice cream whilst walking to the Metro station at Bir-Hakeim. Take the Metro to Charles de Gaulle Etolle and change lines to arrive at Anvers. From Anvers it’s a short uphill walk to the base of the steps to Sacre Coeur. 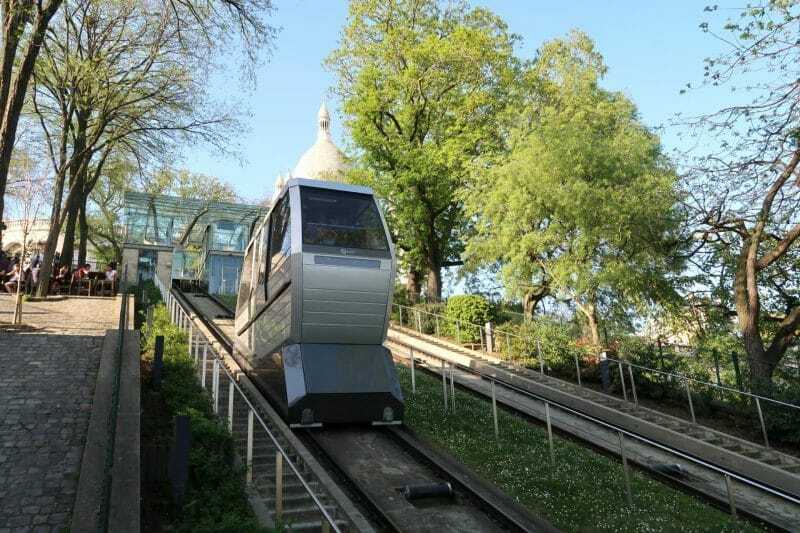 You can get a great view from the bottom and if you walk across to the left you can take the funicular up to the top (it’s not far, but quite fun for children… and adults!). If you have a day ticket for the Metro you can use the ticket like at any other Metro station. At the top of the funicular turn left and walk along the road to a square and you’ll see a square full of artists and outdoor seating for the cafe’s. 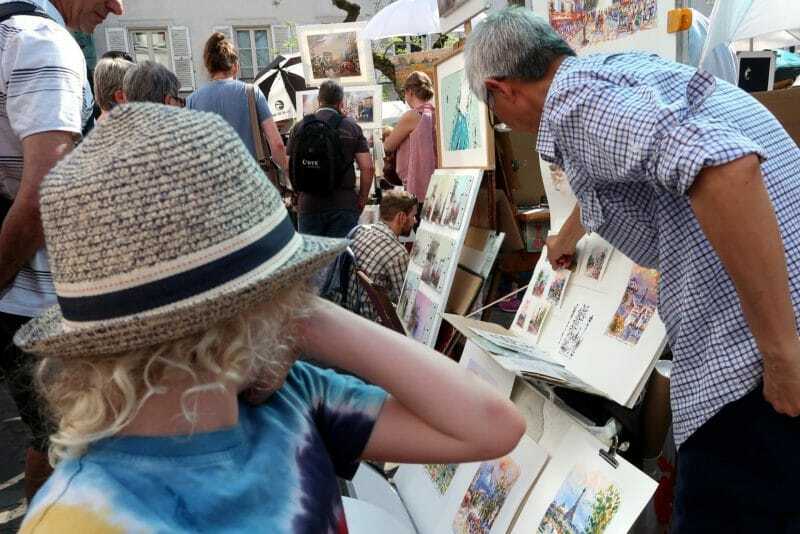 This is brilliant for anybody who is interested in art and you can have a really good look around all the different styles and even buy your own art to take home. By now it’s probably dinner time, so after you have had a good look around settle down in one of the cafes for dinner. 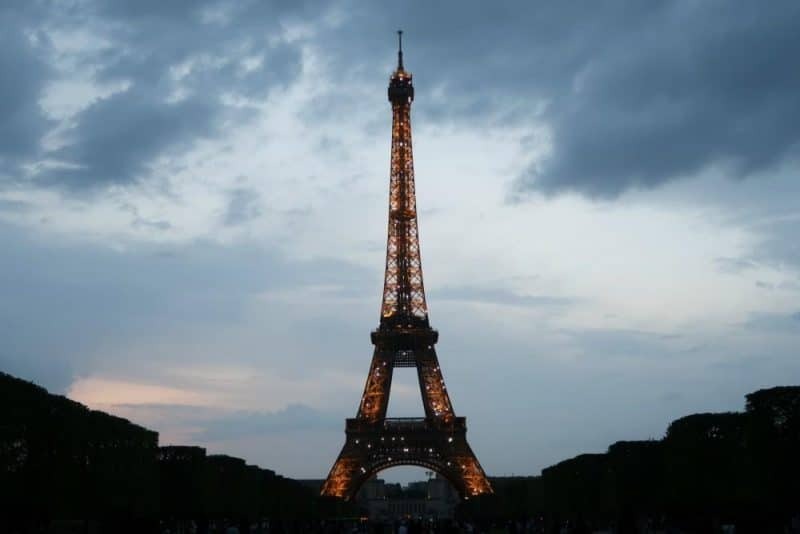 Every night at dusk and each hour thereafter the Eiffel Tower lights up and it sparkles with lights for the first 5 minutes of each hour. Depending on what time you leave Montmarte (and how tired the kids are) you can head back to Parc du Champs de Mars to enjoy the spectacle. 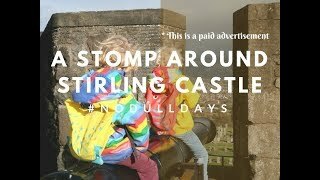 It’s definitely worth heading down to watch! 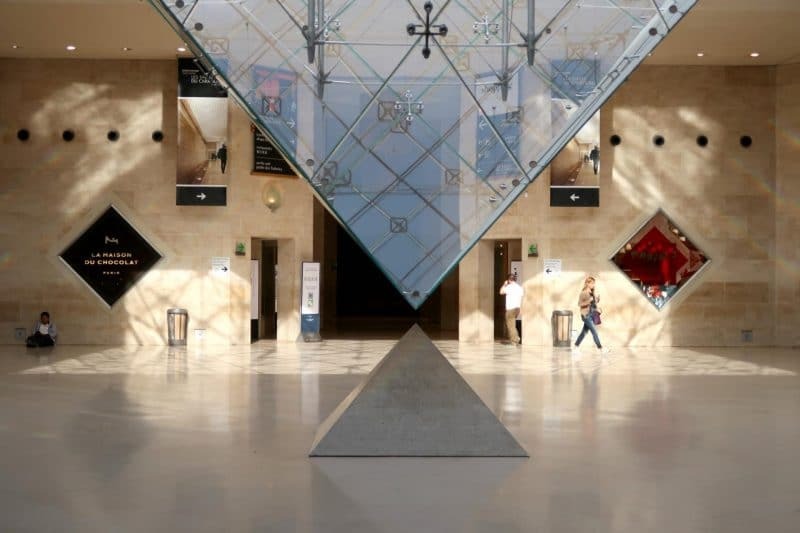 You can take the Metro to the Palais Royal Musee de Louvre, which allows you to walk right into the museum (via security). It’s a great way to enter the building and really makes you understand how big the complex is! 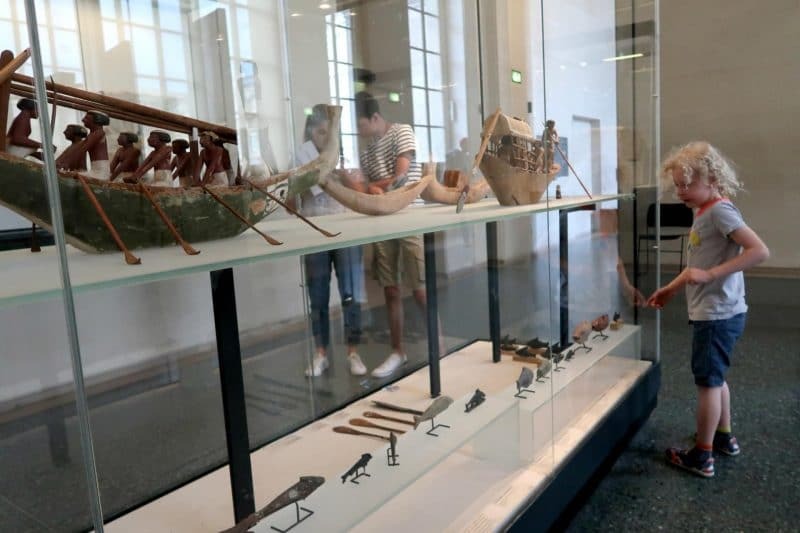 Alternatively arrive via the Tuileries station and you can enter the museum by the pyramids outside. 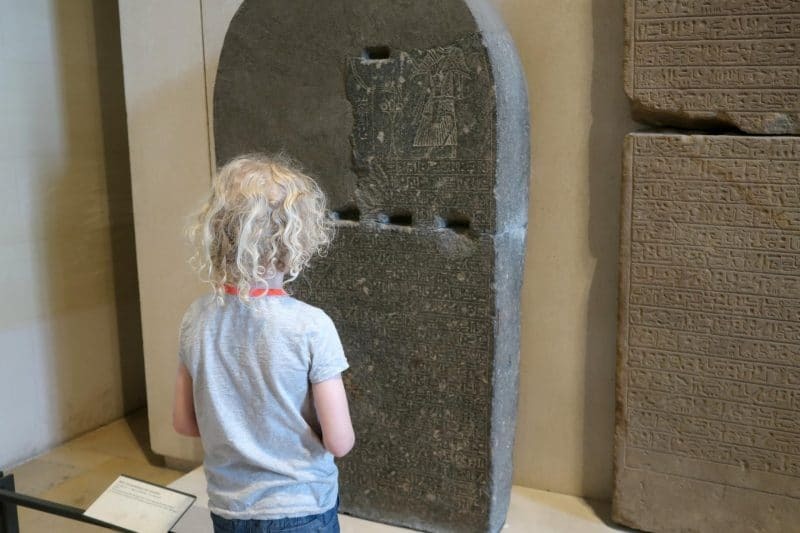 The Louvre museum is ginormous, there’s no way you could see everything in a day on your own, never mind with kids! My advice is to choose an 1 or 2 areas that they or you would really be interested in and visit those. 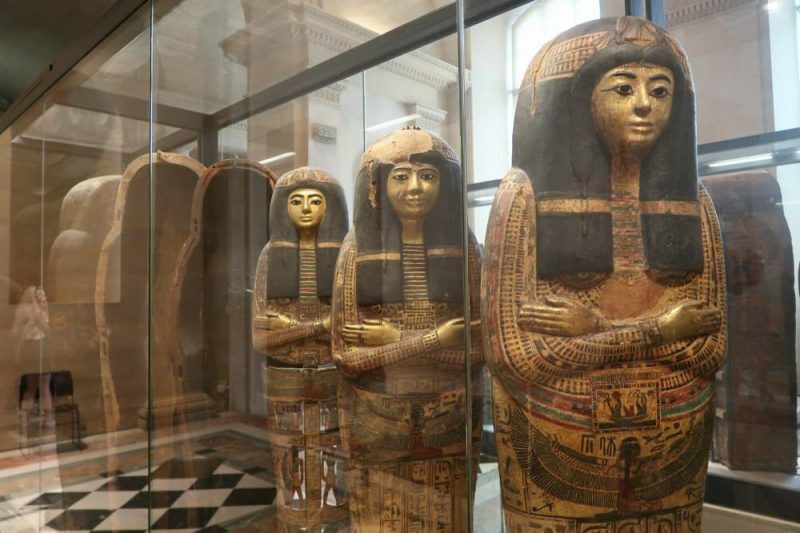 We chose to go to the Egyptian antiquities wing, which had an impressive collection of items ranging from small grave goods to huge sarcophagi. The children were interested for a while, but after 2 hours it was time to cut our losses and find some lunch in the main foyer. You could go back in again after this, but we chose to exit the building to see the glass pyramids and palace from the outside. Of course we couldn’t visit the Louvre and not take a picture of the pyramids with a silly pose! 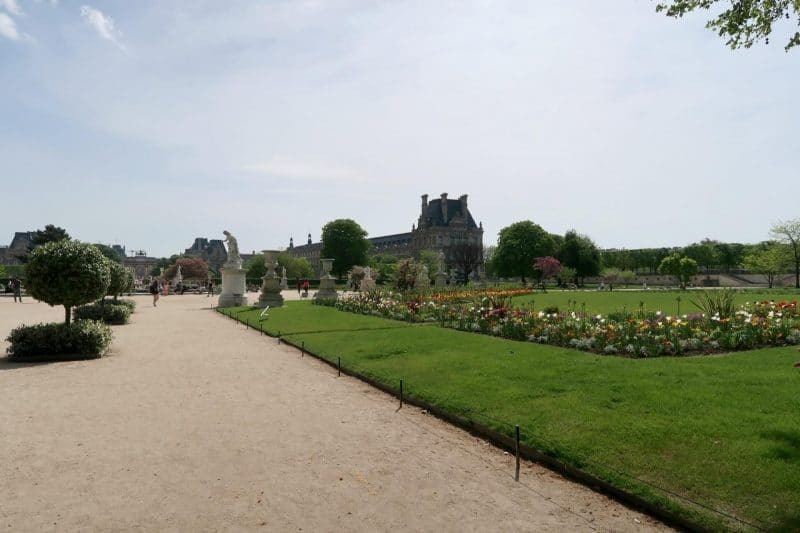 Jardins de Tuileries are brilliant to let the kids run around after being sensible walking around the museum. Bonus is that they are right next to the Louvre museum. You can drag the numerous chairs around anywhere you like and have a snack in the garden or buy something from one of the snack stalls. There are several ponds and during the summer children may bring boats down to push around the pond. From the books we have seen there may be people to rent toy boats from to play on the pond during the summer, but there was nobody there with them when we visited. We found a little playpark for the kids run around in for a while and filled up our water bottles at the pump in the playground. Paris seems to have quite a lot of places to fill up water bottles, including Wallace fountains, which is great when you’re trying to be environmentally friendly! There is also a carousel and ferris wheel at the gardens. The boys chose to go on the carousel before we headed off to our next location. 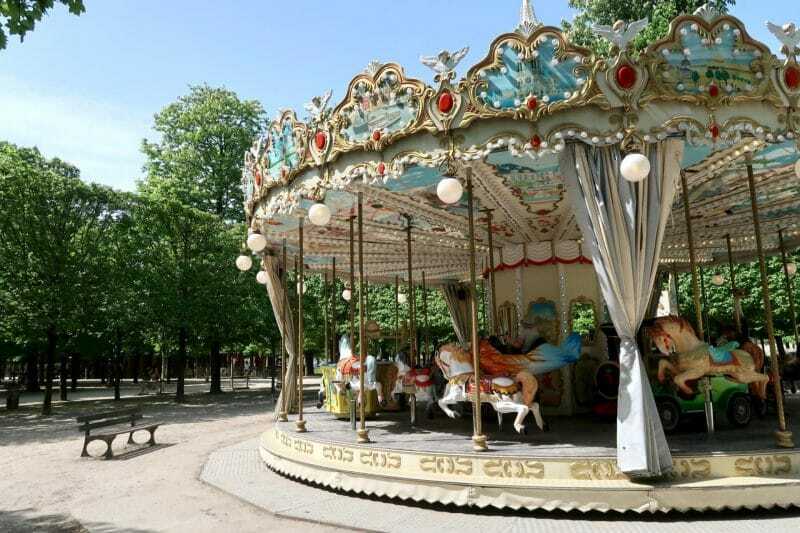 I guess they don’t get to go on carousel’s often, but Paris seems to have them dotted all over the place! 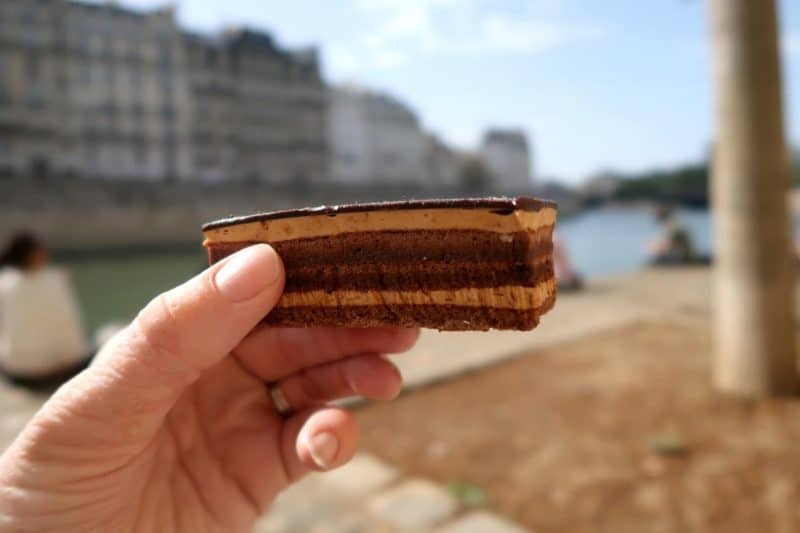 I’m all for combining our love of chocolate with learning, so we took the Metro to Bonne Nouvelle and headed into the Choco Story across the road. 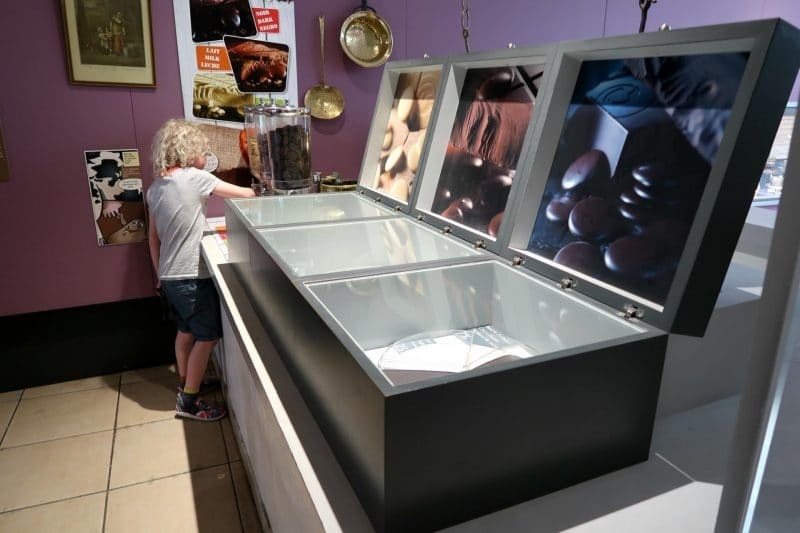 The museum takes you through the history of chocolate. 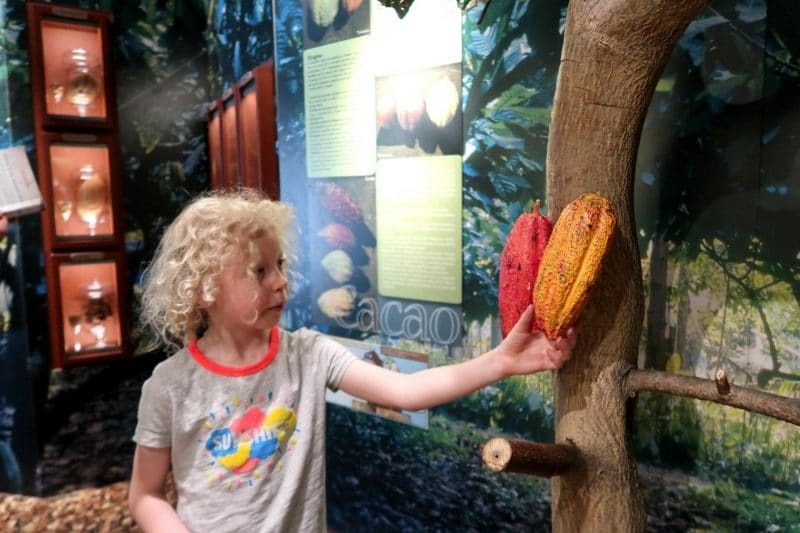 From how cocoa beans grow naturally in the jungle, to using it as an offering to the Mayan gods mixed with blood, all the way through to chocolate arriving in Europe. Children are given a special booklet and stickers, then they need to match up the Playmobil scenes they find with the stickers in their book. At the end they can give their completed booklet to the reception desk for a special chocolate treat. 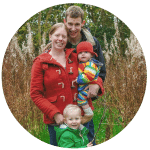 As you walk around the building you are also given a chance to taste the chocolate in the form of chocolate buttons (and you can eat as much as you want!!). The chocolate in the Mayan section is quite bitter as that is how it tasted in their chocolate drink. 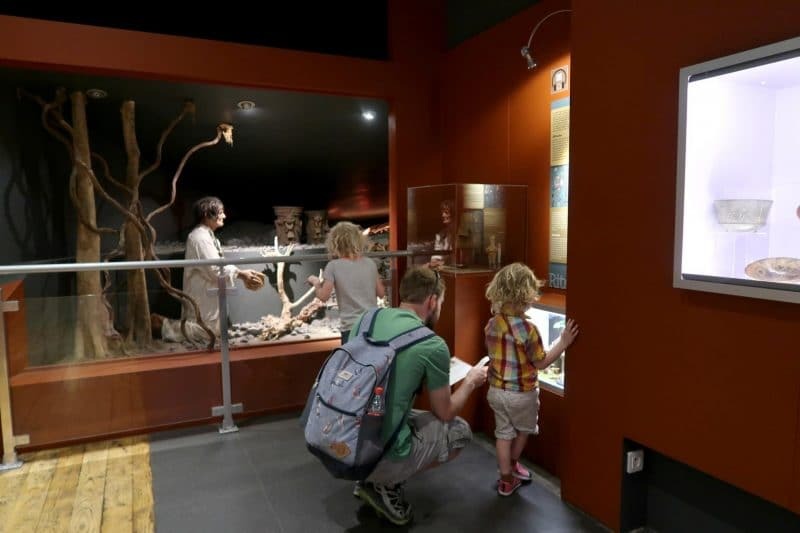 However, the taste becomes more familiar as you head through the exhibits and try more chocolate. 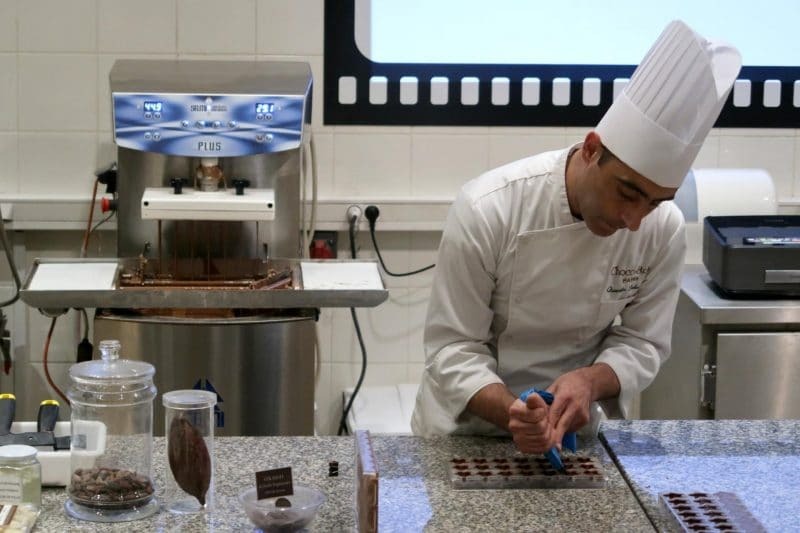 At the end of the museum tour you head into the workshop area where you can watch a demonstration of how chocolate pralines are made. The children were very interested in this, particularly when they got to try some too! 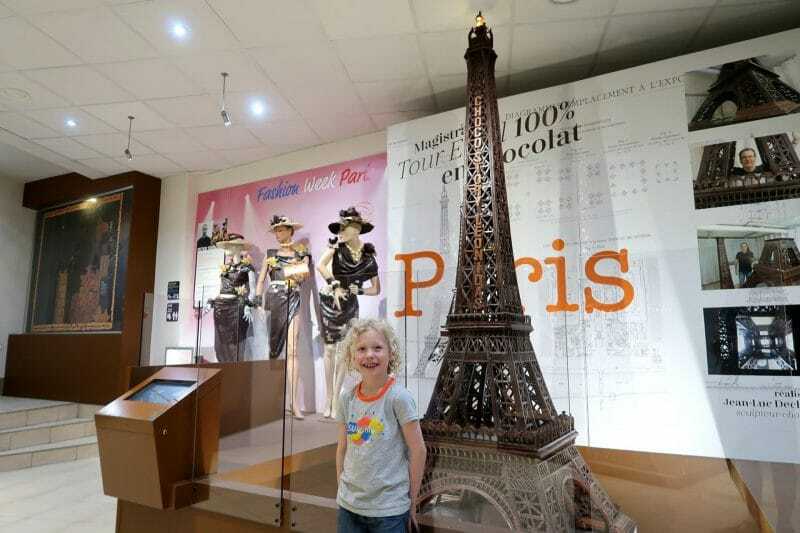 You can also see the stunning chocolate sculptures in this area, eldest was particularly impressed by the Eiffel Tower complete with chocolate lifts! From Bonne Nouvelle metro station it’s just one change at Strasbourg St-Denis to Chatelet where you can walk over one of the bridges over the River Seine watching the boats go underneath and onto the Ile De La Cite where Notre Dame is located. Alternatively you -can just get the metro to cite, which is closer, so not as far to walk. 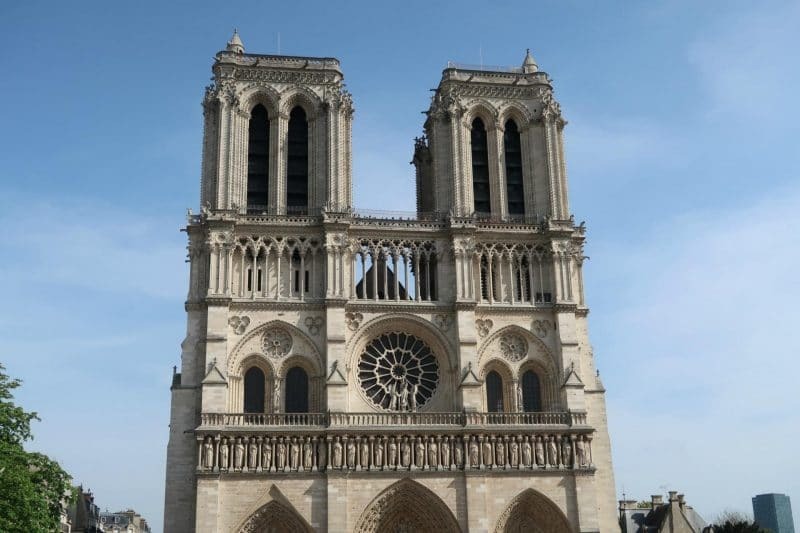 Notre Dame is pretty impressive and the we did consider climbing to the top, but we decided against it as the boys really wanted to find a patisserie. So after a little while sitting down to admire Notre Dame whilst having water and snacks it’s not too far to walk to find a patisserie. 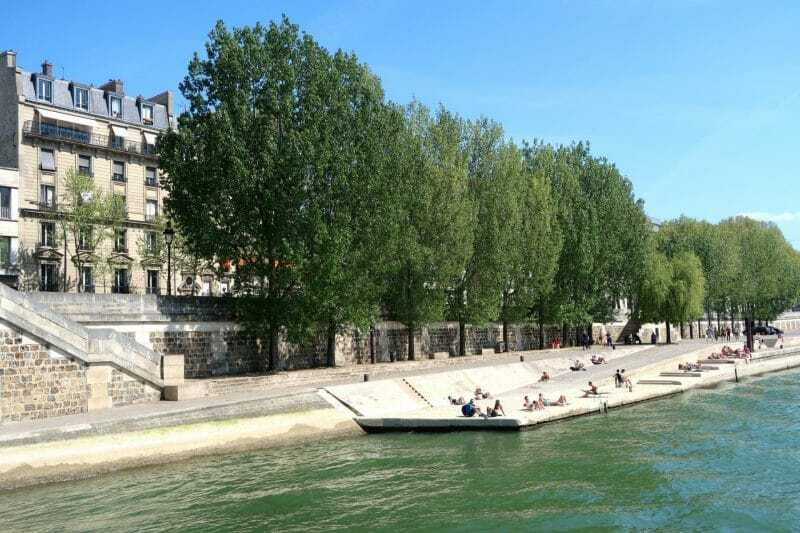 We chose to walk onto the smaller island, Ile Saint-Louis and back onto the river bank opposite. A little searching the streets nearby will find you a patisserie amongst the other shops. Sit down by the river and enjoy your treats! 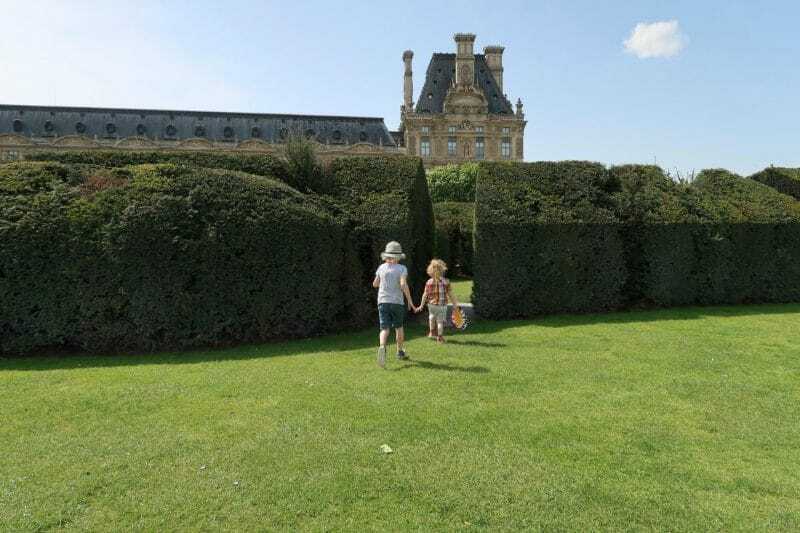 Give the kids the map and choose a metro to walk to, it’s a great way to let the children take charge and get a chance to admire some of the beautiful architecture. 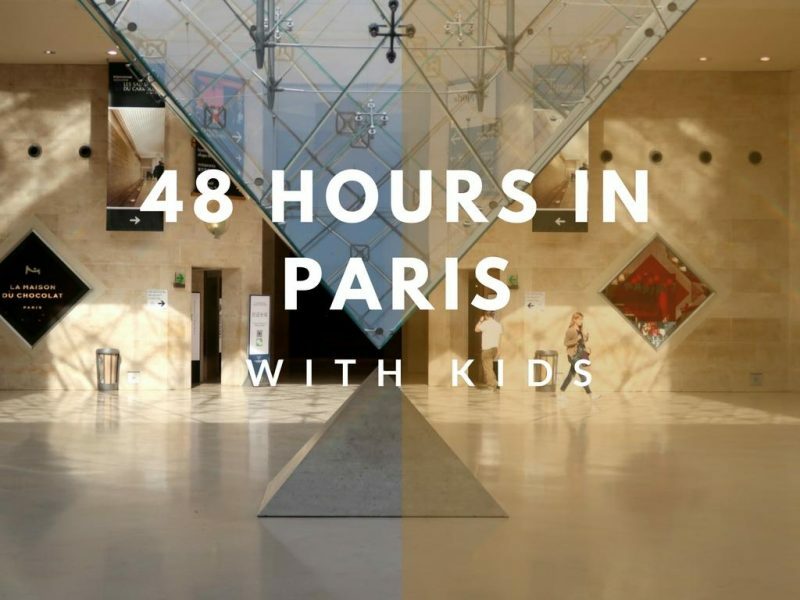 Head out for dinner before going back to your hotel knowing that you’ve seen a lot Paris has to offer and the kids have actually enjoyed it all too! * We received tickets for several of the places on this list, however all opinions are my own. Some brilliant ideas! I love Notre Dame. That chocolate tour sounds amazing, definitely on my list – for when I’m not on a diet! Sounds like a brilliant trip, you packed so much in! It was fantastic thank you! It’s amazing how much you can do in one weekend! I love Paris and your photos are fabulous. Hey! Sorry we missed you this time. Looks like you had so much fun! Hit us up next time you’re in town!